Today’s playoff games are listed below. #4 Taunton, 1 vs. #13 Brookline, 2 – Final (8 inn.) – Luke Figueira pitched seven innings without surrendering an earned run but the Tigers couldn’t overcome a run by the Warriors in the top of the eighth inning. Figueira struck out seven and allowed three hits and four walks in a no decision. Christian Simoes, Jack Moynihan and Matt Machado each had two hits for Taunton, which totaled 11 hits as a team. #9 Franklin, 4 @ #8 Durfee, 6 – Final – Franklin took a 2-0 lead in the top of the first inning but the Hilltoppers climbed back into the game with four in the bottom half and added single runs in the second and third. Offensively, Nick Santucci went 1-3 with an RBI, a walk and a run scored, Brad Jarosz was 2-3, Mike Skaza knocked in a run and both Steve Ferguson and Alex Bissanti scored a run for the Panthers. Sophomore Jake Noviello pitched well in relief for the Panthers, tossing four innings with just one run allowed while striking out five. #12 Attleboro, 1 @ #5 Norwood, 0 – Final (9 inn.) – Click here for a recap of the game. #12 Oliver Ames, 0 @ #5 Nauset, 9 – Final – Oliver Ames only registered a pair of hits against Nauset pitcher Paul Prue, who tossed a complete game shutout with seven strikeouts. Senior Josh Minuskin had a triple and sophomore Matt Muir had a single for OA. #14 Canton, 1 @ #3 Middleboro, 0 – Final (9 inn.) – Canton senior Kevin Powers tossed a complete game, nine inning shutout to lead the Bulldogs past the defending D2 State Champions. Powers worked around a bases loaded situation in the bottom of the eighth and the Bulldogs went on to score the winning run in the top of the ninth. Jim Jenkins had his second hit of the game, a double, and moved to third on a bunt from Jimmy Hamrock. Sean Doyle then connected and Jenkins came home to score on an error. Powers stretched his scoreless inning streak to 24 straight, scattering five hits while striking out six batters. Mike McMahon also had two hits for Canton while Joe Peccia (11 putouts), Joe Bires and Matt Casamento each had a hit. #14 North Attleboro, 7 vs. #19 Walpole, 8 – Final – North Attleboro rallied for four runs in the bottom of the seventh inning but were unable to push the tying run across the plate. Liz Morehouse connected for a two-run home run and Kaylea Sherman had three hits on the day. #16 Mansfield, 4 vs. #17 Notre Dame Academy 0 – Final – The Hornets scored all four runs in the third inning and senior pitcher Maddie Letendre struck out 12 while allowing just two hits as Mansfield advanced in the tournament. Megan Letendre and Marissa Staffier (2-3) each knocked in a run and Maddie Letendre (1-3) singled to score them both to take a 4-0 lead. Bri Homer and Jocelyn Reardon (1-2) scored runs for the Hornets. Mady Bendanillo, Kara Bendanillo and Rachel Carafa each added a hit for the Hornets. #23 Oliver Ames, 4 @ #10 Norwood, 8 – Final – Oliver Ames scored three runs in the first inning and added another in the second but the Mustangs offense proved to be too much. Missy Krim (2-3, run scored) reached on a single to left, advanced on a bunt single from Rachel Han and bunt single from Victoria Ziner (2-4, run scored) loaded the bases. Jamie Gottwald (1-4, RBI, run scored) batted in a run for OA and then scored off a two-RBI hit from Caroline Mahoney (2-3, two RBI). #5 Franklin, 17 vs. #12 Bridgewater-Raynham, 2 – Final – Austin Kent scored four goals and had three assists for the Panthers, who also got four goals and an assist from Eric Civetti. Chase Tanner added three goals for Franklin and Jake Alexander had two, as well as winning 21-of-23 face-offs. #11 King Philip, 6 @ #6 Mansfield, 5 – Final – Click here for a recap of the game. Click here for a photo gallery from the game. #1 Franklin, 11 vs. #8 Newton North, 3 – Final – Franklin raced out to a 7-0 lead at half and held the Tigers of Newton North scoreless for the first 35 minutes of the game. Kenzie Pleshaw had four goals to lead Franklin while Julia Jette had one goal three assists, Diana Griffin scored twice and had a pair of assists. Head coach Kristin Igoe credited her defense with a very strong game, led by Sam Jones, who won six draws and two ground balls. #8 North Attleboro, 10 @ #1 Walpole, 20 – Final – Hana Caster scored four goals for the Rocketeers and Mackenzie Rosenberg added three in the loss. #13 Mansfield, 1 @ #4 Franklin, 4 – Final – Franklin got a pair of wins in both singles and doubles to advance in the MIAA tournament. Junior Eli Brooks battled back for a 5-7, 6-1, 7-6 win at second singles and freshman Dan Barrow won 6-4, 6-2 at third singles. Tom Mancini and James Johnston continued their stellar seasons with a 6-2, 6-1 win at first doubles and Jeremy Gan and Derek Wu won 6-0, 6-1 at second doubles. Mansfield’s Benny Lin won 6-2, 6-2 at first singles. #6 North Attleboro, 5 vs. #11 Brockton, 0 – Final – North Attleboro won four of the five matches in straight sets to knock out the Boxers. Mitchell Dyer won 6-4, 6-3 at first singles, Zack Pfeffer won 6-1, 6-1 in second singles and Barsomo Nuay won 6-1, 6-1 at third singles. Jeff Yao and Ben Pfeffer won 3-6, 7-5, 8-6 at first doubles and Jake Fontes and Daniel Zhang won 6-0, 6-2 at second doubles. #18 Franklin, 5 @ #15 Oliver Ames, 0 – Final – Franklin won all three single matches in straight sets and won both doubles matches in tie breakers to get the sweep. Hannah Sweeney won 6-0, 6-1 at first singles, Anna Humphreys won 6-1, 6-0 at second singles and Anja Deric won 6-0, 6-1 at third singles. Stephanie Schaivo and Katelyn Davenport won 0-6, 7-6 (8-6) at first doubles and Selma Wu and Halle Love won 6-1, 4-6, 1-0 (10-2) at second doubles. #20 Mansfield, 3 @ #13 Marshfield, 2 – Final – The visiting Mansfield Hornet swept doubles play and sophomore Sarah Doyle scored a big win at third singles to get the upset win. Doyle won 6-1, 6-2 to get Mansfield’s lone point in singles play. Senior Cathryn Heavey and junior Chloe Peterson won 6-2, 7-6 (7-3) and freshmen Tessa Garufi and Elizabeth Elsner won 6-2, 6-1 at second doubles. Attleboro, 2 @ Oliver Ames, 1 – Final – Tyler McGovern threw a complete game with seven strikeouts to pick up the win for Attleboro, which qualifies the Bombardiers for the state tournament. Nate Tellier went 2-for-3 with a double and Robbie Araujo had the game-tying RBI with a triple and scored the eventual game-winning run. Stoughton, 1 @ Milford, 2 – Final (10 inn.) – Milford’s Alex Macek and Stoughton’s Nico Parmeggiani went back and forth in a true pitcher’s duel, neither bending to send the game into extra innings. Macek allowed one earned run in seven innings of work, striking out six with four hits allowed. Parmeggiani allowed just one run in six-plus innings of work, striking out three. Tylor Renaud came on in relief for the Scarlet Hawks, tossing three scoreless innings of one hit baseball to get the win. Renaud then came through with the game-winning hit in the bottom of the 10th, knocking in sophomore Aidan Wilde (walk, stolen base) with a two out single into the gap in right center. Oliver Ames, 8 @ Attleboro, 5 – Final – OA’s Missy Krim went 2-4 with two runs scored, Jamie Gottwald was 2-3 with a double, a triple, two RBI and two runs scored, Katie Pursley was 2-4 with two RBI and a run scored, Caroline Mahoney was 3-4 with two RBI and Dalene Gomes squeezed in a run and hit in a run on a sacrifice hit to short, finishing with two RBI on the day. Franklin, 3 vs. Bishop Feehan, 4 – Final – Franklin’s Clara DeCarvalho went 2-3 with an RBI while Olivia Haba, Rachel Cousineau and Julia Arms all played outstanding defensively in the outfield. Mansfield, 3 vs. Holliston, 8 – Final – Mansfield’s Rachel Carafa knocked in two runs on one hit and Megan Letendre went 2-3. Mady Bendanillo, Maddie Letendre and Sarah Bradley each had one hit for the Hornets. Stoughton, 3 @ Milford, 10 – Final – Milford’s Kelley Reichert struck out four in six innings of work to get the win. Jess Tomaso went 2-3 with a two-run home run and a double, Emily Piergustavo had a two-run double, Kate Irwin went 3-4 with three RBI and Maddy Bonvino was 2-3 with a double and two RBI. Jordan Lyons led the Black Knights with three hits. Alecia Quinones had an RBI on a sacrifice fly and Shannon Flaherty had an RBI single for Stoughton. Franklin, 19 @ Milford, 1 – Final – Franklin posted an undefeated league record for the season straight season. Franklin, 5 @ Westwood, 15 – Final – Kendall Reardon and Kenzie Pleshaw each scored two goals for the Panthers and Emily Spath scored one. Oliver Ames, 5 @ Attleboro, 0 – Final – Oliver Ames got the sweep without dropping a game on the road. Riley Spillane won 6-1, 6-2 at first singles, Jackie Sulkala won 6-1, 6-2 at second singles and Sarah Leger won 6-1, 6-0 at third singles. The team of Lark Warner and Valeria Tueme won 6-2, 6-0 at first doubles and Claudia Ferrara and Rachel Stryke won 6-3, 6-1 at second doubles. Milford, 5 @ Stoughton, 0 – Final – Milford’s Allie Collins won 6-1, 6-0 at first singles, Kate Rosenblatt won 6-2, 6-2 at second singles and Jess McIntire won 6-0, 6-2 at third singles. The team of Julie Rabinowitcz and Megan Cafarella won at first doubles and the team of Brianna Capone and Kayla Thongpul won 6-2, 6-4 at second doubles. Foxboro, 7 vs. Dedham, 5 – Final – Click here for a recap of the game. King Philip, 10 @ Sharon, 8 – Final (9 inn.) – Jon Rolfe had three hits and was the catalyst in King Philip’s ninth inning. Rolfe walked in the ninth and advanced on a sac bunt from Jack DiCenso. Ben Furfari had a sacrifice fly, Ryan Coulter doubled and Stephen Murray singled to put the Warriors up. Rolfe was a perfect 3-3 at the plate while Coulter and Will Weir each had two hits. Jake Lannigan allowed six runs in 3 1/3 innings while Rolfe allowed two runs in 4 2/3 innings of relief. Jake Cavanagh closed the game with a strikeout in the ninth. Mansfield, 4 @ Oliver Ames, 5 – Final – Click here for a recap of the game. Milford, 4 @ Franklin, 5 – Final – Each time that Milford made a move, Franklin seemed to have an answer on Friday. The Scarlet Hawks took a 3-0 lead in the top of the fourth only for the Panthers to match it in the bottom half of the inning. Base hits from Olivia Haba and Alyssa DaSilva as well as a sacrifice fly from Julia Arms knotted the game 3-3. Milford’s Jess Tomaso (3-3) belted a solo home run in the top of the fifth but once again, Franklin had an answer. Allie Shea walked and Clara DeCarvalho’s base hit put two on. Junior Alexx Niss connected for a two run double in the inning to put the Panthers ahead 5-4. Caroline D’Aprile struck out four while scattering six hits for the Panthers. Haba came up with three catches in the final innings to help Franklin preserve the win. Mansfield, 3 @ Needham, 2 – Final – Mansfield cashed in early, scoring all three of the team’s runs on four singles in the first inning. Freshman Mady Bendanillo knocked in one run and Liz Mackin plated the other two in the opening frame. Maddie Letendre struck out five, allowing just four hits for the Rockets, whiling going 2-3 at the plate. Rachel Carafa and Megan Letendre each added a hit for the Hornets. Oliver Ames, 10 vs. Walpole, 8 – Final – Oliver Ames erased deficits in both the fourth and sixth innings. After trailing 3-0, Oliver Ames rallied for four runs in the fourth to take a lead. Walpole responded with five runs in the top of the sixth to seize an 8-4 lead but the Tigers clawed back again. A one out single from Dalene Gomes (run) started the rally and Emma Papargiris (2-3, run) followed suit with a hit to put two on. A bunt single from Lizzie Miller (run) loaded the bases for the Tigers. Missy Krim (run, RBI) and Rachel Han (3-4, two runs, RBI) each had an RBI single for OA. Victoria Ziner (run, RBI) hit a sacrifice fly to score Krim to tie the game. With two on, Jamie Gottwald (3-4, double, two runs, three RBI) belted a two run home run to centerfield to give the Tigers a 10-8 lead. Sharon, 10 vs. Ursuline Academy, 4 – Final – Sharon freshman Alli Small hit her first career home run and classmate Jody Goldenberg had an RBI double to lead the Eagles to a non-league win. Senior Clara Cook pitched a complete game for the Eagles, scattering six hits while fanning 10 batters. Senior Jenny Friedman added a pair of hits for Sharon. Stoughton, 8 vs. Brockton, 6 – Final – The Black Knights raced out to an early 8-0 lead and were able to fend off the Boxers to get the win. Karly Estremera hit a two-run homer to start the scoring for Stoughton and Bri Ferrandiz and Nicole Bodette each racked up two hits. Jeni D’Andrea, Sam Tullis, Gina Carafa, Courtney Campbell, Shannon Flaherty, Bridgette Whalen each had one hit for Stoughton. Shannon Flaherty got the win, pitching seven innings and giving up just two earned runs. Sharon, 5 @ North Attleboro, 0 – Final – With the win, Sharon boys tennis has clinched at least a share of the Davenport title. With that, the Eagles have now won 37 straight league titles, dating back to 1980. Griffin Fein won 6-3, 6-1 at first singles, Fred Bondar won 6-1, 6-3 at second singles and Han Cui won 6-1, 6-1 at third singles. The team of Adam Dobbin and Alex Romantz won 6-2, 6-1 at first doubles and the pairing of Tilak Mehta and Andre Olivei won 6-2, 6-5 at second doubles. Taunton, 8 @ Attleboro, 4 – Final – Taunton senior Charles Hearrold III earned the win on the mound, tossing five innings with just one earned run, three hits and two walks allowed. Hearrold III also paced the Tigers at the plate with a pair of hits and a pair of RBI. Luke Figueira and Matt Machado each had a pair of hits for the Tigers as well. Max Bowden knocked in a pair of runs and sophomore Joe Manchester had one RBI. Oliver Ames, 3 @ Canton, 8 – Final – Senior Griffin Jerrier stole the show on the mound for Canton, striking out nine in a complete game effort, scattering six hits and only allowing two earned runs. Mike McMahon (double, RBI) and Joe Bires (run) both had a pair of hits for Canton while Jim Jenkins and Sean Doyle each knocked in a pair of runs for the Bulldogs. For Oliver Ames, sophomore Matt Muir had two hits. Milford, 5 @ Foxboro, 6 – Final – Foxboro’s Jesse Galanti connected for a two run single, turning a 5-4 deficit into a 6-5 lead in the sixth inning and the Warriors were able to hold on. Nick Wright picked up his third save of the season, pitching a scoreless top half of the seventh inning. Andrew Block tossed six innings for the win for Foxboro. Aaron Wentling pitched in with a team-best three hits while Darren Kelly and Wright each had two hits for the Warriors. Mansfield, 1 @ Franklin, 12 – Final – The Panthers’ offense roared to life with all nine players in the lineup getting either a hit or scoring a run. Nick Santucci and Ryan Hodgkins each had a pair of hits and a pair of RBI for Franklin while Josh Macchi knocked in four runs and had a double. Jake Lyons, Mike Skaza, Jason Ulrickson and Alex Bissanti each had an RBI for Franklin as well. Ulrickson got the win on the mound for Franklin, tossing six innings with just two hits allowing and four strikeouts. Classmate Matt Foley closed the game with a scoreless seventh inning. North Attleboro, 0 @ King Philip, 2 – Final – Jack DiCenso tossed a complete game shutout for the Warriors, scattering five hits while striking out six in the win. King Philip scored both of its runs in the first inning. After Kyle Guenthner walked, junior Will Weir plated him with an RBI double. Weir then came around to score on a single from DiCenso. Sharon, 2 @ Stoughton, 4 – Final – Nico Parmeggiani threw a complete game for Stoughton, scattering five hits with only one walk and seven strikeouts to earn the win. Stoughton broke the tie game open with two runs in the bottom of the sixth. Sharon sophomore Max Tarlin had his second straight strong start for the Eagles, going 5 2/3 with five strikeouts and two earned runs, while allowing just two hits. Junior catcher Jake Marglous had a two RBI single for the Eagles. Attleboro, 0 @ Taunton, 9 – Final – Aimee Kistner (four innings, win) and Courtney Fisher (three innings) combined to throw a four-hit shutout and totaled 12 strikeouts in the win. Kya Enos had two hits, including a two-run home run while Jordan Wade had a pair of hits and a pair of RBI, Meghan Navarro had a triple and two RBI and Liana Duarte had a pair of hits for the Tigers. Canton, 1 @ Oliver Ames, 8 – Final – Oliver Ames freshman pitcher Kayla Georgeu only allowed three hits, striking out four in a complete game effort. Missy Krim went 2-3 with a pair of runs scored and had one stolen base, Jamie Gottwald was 2-2 with an RBI and a run scored, Victoria Ziner was 2-3 with a pair of RBI and Katie Pursley (1-2) knocked in a pair of runs for the Tigers and also scored a run. Also for the Tigers, Katie Mills (1-1) knocked in Jordyn Leite (1-1, double). Mansfield, 2 @ Franklin, 0 – Final – Mansfield senior pitcher Maddie Letendre kept the Panthers at bay, allowing just four hits while striking out seven. Freshman Megan Letendre paced the offense with three hits while junior Liz Mackin socked a pair of hits. Mady Bendanillo (RBI) and Amanda Giambanco each had a hit for the Hornets. Mansfield cashed in for both of their runs in the fifth inning with Bendanillo single knocking in Megan Letendre and Maddie Letendre knocking in Bendanillo. King Philip, 6 @ North Attleboro, 5 – Final – After having just one hit through five innings, North Attleboro rallied for five runs in the bottom of the sixth inning to tie the game. But King Philip sophomore Elise Pereira’s solo home run to lead off the seventh inning proved to be the difference. Kali Magane came in and pitched a 1-2-3 seventh inning to preserve the win for the Warriors. After KP scored two runs in both the second and fifth innings, North Attleboro used a grand slam from Kaylea Sherman to tie the game in the sixth. Christa Wagner, Pereira, Magane, Brooke Taute and Meghan Gorman all had two hits for KP. Mycala Moody and Gina Miceli each had a pair of hits for the Rocketeers. Stoughton, 5 @ Sharon, 1 – Final – Stoughton’s Shannon Flaherty tossed a complete game without surrendering an earned run. Flaherty also struck out nine while issuing three walks. Jeni D’Andrea, Gina Caraffa, Karly Estramera, Sam Tullis and Flaherty each had hits for the Black Knights. Attleboro, 6 @ Oliver Ames, 8 – Final – Oliver Ames senior attack Matt Gilson scored four goals and sophomore attack Eric LeBlanc added a pair of goals for the Tigers. Canton, 14 @ Milford, 1 – Final – Jack Dillon, Matt Mackay and Dan Cohen all scored their first career goals in the win for the Panthers. Dylan Cunningham had a pair of saves in a shutout fourth quarter in the cage. Canton head coach Bill Bendell said DJ Trerice played well at midfield and both Brian Albert and George Kent played great defense. Foxboro, 3 @ Franklin, 11 – Final – Click here for a full recap. King Philip, 11 @ Sharon, 9 – Final – King Philip overcame from a four goal deficit at halftime and a three minute locked in penalty to start the fourth quarter to beat the Eagles. Sharon held a 3-0 lead after a quarter and a 5-1 lead at the break. Sharon led 7-5 going into the final quarter but an illegal stick forced KP into a man down situation for three minutes locked in. KP senior Steven Eaton kept the Warriors rolling, setting up a pair of man-down goals for KP to tie the game less than halfway through the final quarter. Junior Tim Watson scored one of his three goals with just 2:51 left to put KP up 10-8. After KP pulled within one, Eaton iced the game with a goal with 15 seconds left. Watson finished with three goals and four assists while Sam Agricola found the back of the net four times. Harry Fallon scored twice and had one assist, Anthony Truini scored once and Michael Curtin had one assist for KP. Junior goalie Paul Macrina notched 13 of his 21 saves in the second half for KP. North Attleboro, 4 @ Mansfield, 11 – Final – Mansfield senior defenseman Josh Schafer set the tone early for the Hornets, going coast to coast and finding the back of the net for the first goal of the game and Mansfield held a 4-1 lead at the halftime break. The Hornets continued the attack with a 7-3 second half. Ryan Smith scored three goals and had an assist and Jon Reed found the back of the net twice for Mansfield. Connor Finerty, Billy Grant (two assists), Jarrett Saunders, Hunter Ferreira (assist) and Sam O’Connell each scored once for Mansfield. Milford, 3 @ Canton, 17 – Final – Mary Nee found the back of the net four times for the Bulldogs. Franklin, 13 @ Foxboro, 8 – Final – Franklin senior goalie Dani Lonati made 11 saves to hold off the Davenport division leading Warriors. Franklin’s Julia Jette scored three goals and had two assists while Kendall Reardon had two goals and three assists and Emily Spath found the back of the net three times. Mansfield, 10 @ North Attleboro, 19 – Final – Hana Caster led the Rocketeers with five goals and five assists, while sophomore Mackenzie Rosenberg added six goals for North. Brooke Ebert played well in goal, according to North coach Mike Vitelli. Taunton, 5 @ New Bedford, 8 – Final – Taunton goalie Lorna Li made 20 saves in the cage for the Tigers but the Whalers were able to get the close win. Abbey Kingman scored twice and Kayla Phillips, Lindsay Sneyd and Riana Winslow each scored once for Taunton while Annie Tate had an assist. Taunton, 3 @ Attleboro, 2 – Final – The Tigers got a pair of wins in singles play and clinched the win with a win at first doubles. Freshman Brett Beaulieu won 6-2, 6-2 at first singles for Taunton and Mike Briggs picked up a 6-0, 6-1 at third singles. The team of Connor Briggs and Charlie Fiske won 6-0, 3-6, 6-0 at first doubles for the Tigers. Attleboro’s Timothy Vermilyea won 1-6, 6-2, 6-0 at second doubles and the team of Shaun Gordon and Gaashaan Yusuf won 6-3, 6-0 at second doubles for the Bombardiers. Franklin, 3 @ Mansfield, 2 – Final – Franklin got a clean sweep at doubles and freshman Dan Barrow won at third singles to secure a win for the Panthers. Junior James Johnston and senior Tom Mancini won 6-0, 6-2 at first doubles and sophomores Tyler DiPalma and Derek Wu won 6-1, 6-4 at second doubles for the Panthers while Barrow won 6-4, 6-3 at third singles. North Attleboro, 3 @ King Philip, 2 – Final – King Philip’s Cole Ginter won at first singles, 6-7 (2-7), 6-1, 6-4 and the team of Justin Rohan and Marco DiStefano won 6-4, 6-4 at second doubles. Sharon, 5 @ Stoughton, 0 – Final – Sharon freshman Danujan Thirumavalavan picked up a 6-1, 6-0 at first singles, sophomore Andre Olivei won 6-1, 6-1 at second dingles and senior Andrew Tarnoff swept 6-0, 6-0 at third singles. Sophomore Russell Rapaport and freshman Max Brody teamed up for a 6-0, 6-2 win at first doubles for the Eagles and junior Sharov Mikhail and senior Jing Huang won 6-0, 6-1 at second doubles. Attleboro, 0 @ Taunton, 5 – Final – It was a clean sweep for the Tigers, who won in straight sets in each match. Jordan Paglica won 6-0, 6-0 at first singles, Olivia Sweeney won 6-1, 6-4 at second singles and Kelsey Hebert won 6-0, 6-0 at third singles for the Tigers. The team of Ashleigh Eason and Emily Moor won 6-1, 6-0 at first doubles for Taunton and Caroline Hebert and Jillian Pagliuca won 6-0, 6-0 at second doubles. Canton, 3 @ Oliver Ames, 2 – Final – Canton got wins at first and second singles as well as first doubles to get the win. Tiffany Ha and Sarah MacQuarrie picked up their third win in as many days, notching a 6-0, 6-1 win at first doubles. Carly Scanlon won 6-0, 6-1 at first singles and Skyler Jabbour won via forfeit (injury) at second singles. OA’s Sarah Leger won 6-3, 7-6 at third singles and Rachel Stryke and Claudia Ferrera won 6-2, 6-3 at second doubles. Mansfield, 3 @ Franklin, 2 – Final – Mansfield swept both doubles matches and got a win from sophomore Sarah Doyle at third singles to edge the Panthers. Doyle won 6-0, 6-3 at third singles while Cathryn Heavey and Chloe Peters won 6-1, 6-3 at first doubles. The team of freshmen Tessa Garufi and Elizabeth Elsner took a 6-3, 3-6, 6-2 win at second doubles to help clinch the win for the Hornets. Franklin’s Anna Humphreys won 7-6, 7-6 at first singles and junior Anja Deric won 6-0, 6-2 at second singles for the Panthers. Attleboro, 3 @ Franklin, 4 – Final – Franklin rallied for two runs in the bottom of the seventh, the second scored by Jake Lyons (1-3, BB) on a wild pitch as the Panthers walked off with the win. Junior Tyler Gomes went 2-3 with a pair of RBI and Mike Skaza also added two hits for Franklin. Nick Santucci added a double, a walk and two runs scored. Ryan Morse earned the win after pitching a scoreless top half of the seventh. Bryan Woelful pitched a scoreless sixth in relief while sophomore Jake Noviello got a no decision after five innings of work, striking out seven with four walks. Attleboro’s Nate Tellier pitched six innings, striking out eight and scattering six hits. Jon Dunn went 3-3 with a walk for the Bombardiers, James Weir went 2-4 with two RBI and Patrick Collins had two hits, including a double. Canton, 12 @ Foxboro, 5 – Final – Kevin Powers knocked in four runs and Mike McMahon had four hits as Canton’s offense tied its highest output of the season. McMahon was 4-5 with three runs scored and a stolen base while Powers had two hits, including a triple and a run scored. Joe Peccia added three RBI, connecting for a home run and three runs scored, Joe Bires knocked in a pair of runs and Jim Jenkins also had an RBI. Daniel Harnett went 1-2 with an RBI sacrifice fly and sophomore Matthew Casamento was 3-4 with two runs scored. Powers got the win on the mound, throwing four innings with seven strikeouts and two earned runs allowed. Steve Gorham pitched the final three innings with four strikeouts. Mansfield, 6 @ King Philip, 7 – Final – Senior Jake Cavanagh took the mound in the seventh inning with the Warriors clinging to a one run lead, inheriting runners at second and third with just one out. But Cavanagh got out the jam, inducing a grounder to short and a fly ball to center to notch his first save of the year. Will Weir, Kyle Guenthner, Jake Lannigan and Jon Rolfe each had two hits for the Warriors. Rolfe got the win on the mound for KP, going 5.2 innings. Sharon, 0 @ Milford, 8 – Final – Milford junior Blake Hill needed just 81 pitches in a three-hit complete game effort, striking out eight on the mound to earn the shutout win. Hill helped his cause at the plate, going 2-4 with two RBI and a triple. Sophomore Aidan Wilde also had two hits for the Scarlet Hawks, going 2-3 with a double and three RBI. Oliver Ames, 12 @ Stoughton, 2 – Final – Oliver Ames’ Josh Minuskin led the way with four hits for the Tigers while Chris Romero recorded three hits in the game. Attleboro, 0 @ Franklin, 12 – Final (5 inn.) – Clara DeCarvalho belted a three run home run and Julia Arms, Olivia DiGiacomo and Maddie Connelly all knocked in a pair of runs in Franklin’s big win. DeCarvalho went 2-4 with four RBI on the day while Connelly was 2-4, Arms went 2-2 with a walk and DiGiacomo was 1-3. Alex Niss added two hits at the plate for the Panthers. Kim Moulton and Amanda Mandall connected for a 6-3-2 double play, halting a threat from the Bombardiers. Caroline D’Aprile tossed three shutout innings with four strikeouts while Emily Sawyer pitched a scoreless final two innings. King Philip, 6 @ Mansfield, 1 – Final – King Philip scored a pair of runs in each the fourth and fifth innings and capped it with another run in the seventh inning. Kali Magane pitched five innings, allowing just two hits and one unearned run while Jenn Hutynan pitched the final two innings, allowing just one hit. Magane helped her cause by knocking in a pair of runs in the top of the fourth and then Hailey McCasland knocked in Christa Wagner and Elise Pereira knocked in McCasland. Sydney Phillips knocked in a run with a triple in the seventh. Liz Mackin, Rachel Carafa and Megan Letendre each had a hit for the Hornets, who received a strong pitching performance from Maddie Letendre. Letendre struck out seven while scattering six hits. Milford, 12 @ Sharon, 0 – Final (6 inn.) – Milford’s Kelley Reichert took a no hitter into the sixth inning, eventually finishing with a one-hit complete game shutout effort, striking out six for the Scarlet Hawks. Megan Jacques went 2-3 with a double and two RBI, Emily Hartman had a triple and an RBI, Jess Tomaso had a triple and two RBI and Kate Irwin was 2-3 with two stolen bases for Milford. North Attleboro, 2 @ Taunton, 7 – Final – North Attleboro became the first team to score an earned run on the Tigers, plating a pair in the fourth inning. But Taunton pitcher Aimee Kistner only allowed five hits in the game with five strikeouts and the Tigers played “outstanding team defense” according to head coach Dave Lewry. Meghan Navarro was a perfect 4-4 at the plate with an RBI and Jaime Brown went 3-3 with three RBI. Katie Van Zandt was 2-3 with an RBI and Becka Lajoie added a base hit RBI for Taunton. North Attleboro’s Jordan Sharpe (single) and Liz Morehouse (double) were both knocked in by a Kaylea Sherman double for North Attleboro’s runs. Oliver Ames, 10 @ Stoughton, 4 – Final – Victoria Ziner and Jamie Gottwald combined for 12 put outs in the field, backing up a complete game effort from pitcher Kayla Georgeu. The Tigers had 11 hits spread out through the lineup. Ziner was 2-3 with three runs scored, a stolen base and an RBI, Gottwald was 2-2 with two walks, a triple, an RBI and three runs scored, Missy Krim went 2-4 with a double and a run scored, Katie Pursley had two hits, two RBI and two runs scored for OA. Emma Papargiris and Jordyn Leite each knocked in two runs for the OA, Caroline Mahoney had an RBI and Rachel Han scored a run. Taunton, 7 @ Milford, 5 – Final – Taunton rallied three times from deficits (2-0, 4-2, 5-4) to earn the program’s first varsity win and it’s first Hockomock League win. Freshman Ryan Williams played his best game according to head coach Kris Metea, limiting the Scarlet Hawks to just one early goal in the second half. Williams made 14 saves, with six of his nine second half saves coming in the final quarter. Senior Jason Stern recorded a hat trick to pace Taunton’s offense while sophomore Cam Welby scored twice and had one assist. Eighth grader Tommy Joyce recorded two points with a goal and an assist, junior Lee Gobin scored once and senior Kyle Hebert had an assist. Milford, 21 @ Taunton, 13 – Final – Abbey Kingman led Taunton’s offense with four goals while Lindsay Sneyd scored a hat trick, Kayla Philips and Bre Conlon each found the back of the net twice and Layne Kingman and Tatum Speicher each scored once. Attleboro, 0 @ Franklin, 5 – Final – Franklin freshman Dan Barrow didn’t drop a single game at third singles, winning 6-0, 6-0 to spark the Panthers. Junior Rahul Herur won 6-1, 6-0 at first singles and classmate Eli Brooks battled back for a 4-6, 6-2, 6-3 win at second singles. James Johnston and Tom Mancini won 6-1, 6-0 at first doubles and Tyler DiPalma and Derek Wu won 6-1, 6-2 at second doubles for Franklin. Mansfield, 2 @ King Philip, 3 – Final – King Philip took care of business in doubles play and secured the victory with one win at singles to beat Mansfield. Sam Colella and Ryan Gemelli continued their strong season with a 6-2, 6-2 win at first doubles and Justin Rohan and Marco DiStefano won 6-1, 6-0 at second doubles. Garrett Schneider clinched the win with a convincing 6-0, 6-2 win at second singles. Mansfield’s Benny Lin notched a 6-4, 6-4 win at first singles and Gus Daganhardt picked up a 7-5, 6-2 win at third singles. Taunton, 0 @ North Attleboro, 5 – Final – North Attleboro won all five matches in straight sets to beat Taunton. Senior Mitchell Dyer won 6-0, 6-1 at first singles, junior Zack Pfeffer won 6-0, 6-3 at second singles and junior Barsomo Nuay won 6-0, 6-1 at third singles. The team of seniors Jeff Yao and Nick Lockavitch won 6-0, 6-3 at first doubles and senior Jake Fontes and junior Daniel Zhang won 6-3, 6-1 at second doubles for Big Red. Stoughton, 1 @ Oliver Ames, 4 – Final – Oliver Ames was paced by three seniors in singles play to pick up the win. Thomas O’Leary won 6-1, 6-2 at first singles, Greg Weinstein won 6-1, 6-1 at second singles and Jared Hedlund won 7-6 (7-3), 6-1 at third singles. Franklin, 5 @ Attleboro, 0 – Final – The Panthers didn’t drop a game at first singles or doubles on their way to the sweep. Hannah Sweeney won 6-0, 6-0 at first singles and the team of Anja Deric and Katelyn Davenport won 6-0, 6-0 at first doubles. Steph Schiavo won 6-4, 6-1 at second singles and Madison Derby won 6-4, 6-4 at third singles. Franklin’s Hailey Strier and Kristina Stoyanova won 3-6, 6-4, 6-4 at second doubles. Foxboro, 4 @ Canton, 1 – Final – Foxboro only dropped one game in all three singles matches combined to get the win. Diana Prinos and Lexi Nelson both won 6-0, 6-0 at first and third singles respectively while Sophia Prinos won 6-0, 6-1 at second singles. Diana Hickox and Michaela McCarthy added another win for the Warriors, winning 6-3, 6-4 at second doubles. Canton’s Tiffany Ha and Sarah MacQuarrie rallied for a 2-7, 7-6, 6-1 win at first doubles for the Bulldogs. King Philip, 3 @ Mansfield, 2 – Final – King Philip took a pair of wins from doubles and won at third singles to edge out the Hornets. Juniors Corinne Palumbo and Megan Davenport won 7-5, 6-4 at first doubles and junior Carly Adams and senior Kelly Masse won 6-2, 6-0 at second doubles. Sophomore Meghan Sepich helped clinch the win with a 6-3, 6-2 win at third singles. Mansfield junior Paulina Martin won 6-0, 6-0 at first singles and senior Kathleen Giffels won 6-3, 7-5 at second singles for the Hornets. Oliver Ames, 5 @ Stoughton, 0 – Final – Oliver Ames senior captain Jackie Sulkala earned the Tigers first win, winning 6-0, 6-2 at second singles and OA rolled. Riley Spillane won 6-3, 6-0 at first singles and Olivia Groebe won 6-4, 6-4 at third singles. The team of Lark Warner and Valeria Tueme won 6-2, 6-3 at first doubles and Rachel Stryke and Claudia Ferrara teamed up for a 6-3, 6-3 win at second doubles for OA. Milford, 3 vs. Taunton, 1 – Final – After losing a close first game, Milford responded with a dominant second game scored a 23-25, 25-9, 25-22, 25-20 win over the Tigers. Senior Ryan White had 11 aces for the Scarlet Hawks along with 19 assists, six digs, six kills and six service receptions while senior Mike Haver had eight kills, four service receptions, a pair of digs and a block. Senior Juan Ruelas added six kills, five assists, a pair of digs and service receptions and a block for Milford and classmate Nick Roy had six kills, three digs and two aces. Junior Danny Zwonik also had two kills and two aces, along with a block, a dig and a service reception for Milford. NORTH EASTON, Mass. 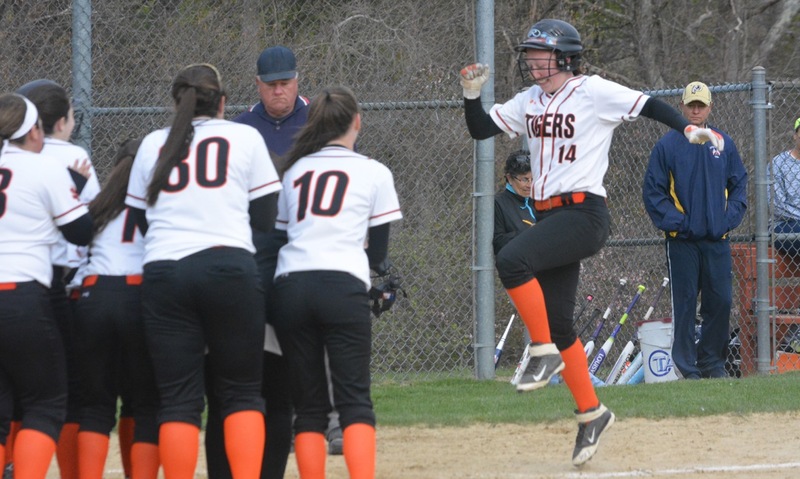 – In the bottom of the fourth inning, Oliver Ames senior first baseman Jamie Gottwald stood at the plate with two outs and two runners in scoring position with the Tigers trailing by two. Foxboro freshman Emma Rohan caught Gottwald looking with a nasty pitch on the inside corner to end the jam. When Gottwald came up in the sixth with two outs and two runners on and the Warriors still out in front 4-2, OA coach Lindsey Allison expected the outcome to be very different. Foxboro loaded the bases in the first inning against OA starter Alexis Campbell, but a grounder to Rachel Han cut down the lead runner at the plate and Katie Pursley turned it into a double play with a quick relay to first. Campbell escaped the jam by getting Ryann McGowan to bounce to third. The Tigers jumped out to a lead in the bottom half of the inning. Campbell walked with one out and Victoria Ziner, who missed almost all of last spring with an illness, lined a hit to left. Gottwald and Pursley followed with hard-hit line drives that skipped off gloves in the infield and brought in a pair of runs for a 2-0 advantage. The lead was short-lived, as Foxboro put up a four-spot in the second. Chelsea Gibbons led-off with a single and moved to second on a groundout. Camryn Willis singled to put runners at the corners and Kelli McCarthy had a bunt single that loaded the bases. After a fly ball to center for the second out, Foxboro catcher Hannah Davis drove over the head of centerfielder Missy Krim for a double that brought in two, while confusion in the infield on a rundown allowed McCarthy to score as well. Kelly Fisher followed with the first of her two hits to plate Davis and make it 4-2. In the third, Allison turned to Georgeu. The freshman struggled at first, walking three of the first four batters she faced to load the bases, but came back to strike out McCarthy for the second out and then got a foul pop to Gottwald at first to end the threat. The Warriors also had a pair of runners on in the fourth inning, but Davis was caught stealing on a great catch and tag by Ziner and Georgeu managed to work her way out of the jam. Meanwhile OA continued to get base runners against Rohan, but the Foxboro freshman seemed to come through with the big pitch when she needed and the Warriors made plays behind her, including Davis catching Pursely leaning at third for an important first out in the bottom of the fifth. In the sixth, Rohan was one strike from getting through the inning clean, but Campbell worked a two-out walk and Ziner followed with a slap single to left, which set the table for Gottwald’s heroics. Georgeu had settled down after a shaky start to her relief outing and in the seventh she got some help from her defense. Marylou Long led-off with a deep drive to center that Krim tracked all the way and snagged just before falling into the fence. McGowan grounded to third and Han’s throw was high but Gottwald managed to leap and snare it and then come down on the bag for the second out. Georgeu then got a pop up to retire her 10th straight hitter and seal the win. Allison knows that her team needs to cash in with runners on base, but she credited the Tigers for making plays to pick each other up and working as a team to get the win. Oliver Ames (5-4, 4-3) will travel to Mansfield on Monday, while Foxboro (4-5, 3-4) will be on the road at North Attleboro. Foxboro, 1 @ Attleboro, 9 – Final – Tyler McGovern was masterful on the mound and Nate Tellier was perfect at the plate as Attleboro picked up a win over visiting Foxboro. McGovern threw a complete game, scattering three hits and striking out 12 to get the win. Tellier was 4-4 at the plate with a pair of doubles and a triple. He also drove in a pair and had two stolen bases. Will Carter added a double and a triple and Jon Dunn had two hits and two RBI for the Bombardiers. Mansfield, 3 @ Hingham, 2 – Final Mansfield rallied in the top of the seventh inning with two runs to beat the Harbormen on the road. Freshman Dan Saraceno led off the final inning with a triple and Max Boen knocked him in for the tying run with a single. Boen eventually came around to score the go-ahead run on a passed ball. Sophomore Tyler Dalton got the win on the mound in a complete game effort. Dalton struck out four, scattering five hits. He closed the door in the seventh by inducing a 1-6-3 double play. King Philip, 7 vs. Bishop Feehan, 3 – Final – Kali Magane delivered a stellar performance in the circle to help the Warriors avenge a loss to the Shamrocks earlier this month. Magane struck out 12, allowing just three hits on the day. Christa Wagner was 4-4 on the day with a homerun, a triple and three runs scored. Jenn Hutnyan added a two-run double and Magane helped her own cause with a pair of hits at the plate. Mansfield, 10 @ Holliston, 5 – Final – The Hornets capitalized on nine hits to double up on Holliston. Megan Letendre had two hits and two RBI, Kara Bendanillo had a pair of hits and Maddie Letendre had one hit and two RBI. Marissa Staffier and Bri Homer each had a hit, Mady Bendanillo had a triple and scored on an error and Sarah Bradley had her first varsity hit and an RBI for the Hornets. Maddie Letendre stuck out seven, allowing five hits in a complete game effort to get the win. Oliver Ames, 5 @ Walpole, 1 – Final – Freshman Kayla Georgeu kept the Rebels at bay, tossing a complete game with five strikeouts and only four hits allowed. OA’s bats came to life with nine hits on the day. Missy Krim was 2-4 with an RBI and a run scored, Rachel Han was 2-3 with a double and a run scored, Katie Pursley had a big triple in the 7th to score Jamie Gottwald (hit, RBI) and Victoria Ziner was 2-4 with an RBI and a run scored. Franklin, 17 vs. Medfield, 6 – Final – Franklin raced out to a 9-0 lead in the first half and never looked back against D2 powerhouse Medfield. Kendall Reardon led Franklin with three goals and two assists while Kenzie Pleshaw and Diana Griffin had three goals apiece. Julia Jette and Halle Atkinson each had two goals for the Panthers. Head coach Kristin Igoe said Dana Lewandowski played well on defense, causing three turnovers. Franklin, 12 vs. Framingham, 4 – Final – Senior Nick Santucci made a splash in his first game of the season, knocking in five runs behind a three hit day. Santucci had a double, triple and a home run for the Panthers. Jake Lyons was 2-2 (and two walks) with three runs scored, Josh Macchi had three hits with an RBI and a run scored and Alex Bissanti had a pair of hits and a pair of RBI with a run scored. Sophomore Jake Noviello got the win on the mound, tossing six innings with eight strikeouts and just two works, allowing two earned runs. Mansfield, 0 @ Braintree, 7 – Final – The Hornets were limited to three hits in the game with Tyrone Pascual having a double and Max Boen and Kevin Dow each recording a single. Stoughton, 3 @ Taunton, 6 – Final – Luke Figueira struck out 10 in six-plus innings of work to lead the Tigers to their second win in as many days. Figueira allowed three runs, all coming in the seventh, and just four runs. At the plate, the senior had a pair of hits and a run scored. Sophomore Joe Manchester had two hits, two RBI and a run scored and senior Brendon Mazerolle and sophomore Christian Simoes each added two hits, an RBI and a run scored. Mazerolle picked up his first save of the year, inheriting a bases loaded situation – the tying run at the plate – with no outs and was able to get out of the jam. North Attleboro, 16 @ Canton, 2 – Final – North Attleboro’s Amelia Murphy tossed a two-hitter to earn the win and helped her own cause at the plate with a home run and a triple. Kaylea Sherman added a home run and a single, Jordan Sharpe went 4-5 with five RBI and Gina Miceli and Rylee Guthrie each added a pair of hits for the Rocketeers. Milford, 11 vs. Hopedale, 3 – Final – Ali Atherton didn’t allow a run in six innings of work, scattering three hits and striking out eight to hand Hopedale its first loss of the season. Jess Tomaso was 1-2 with a home run, two RBI and a pair of walks and Meg Jacques went 2-3 with a double and three RBI. Maddy Bonvino went 1/2 with a double, an RBI and a walk and Emily Piergustavo was 1-3 with a sacrifice fly and two RBI. Oliver Ames, 1 vs. Weymouth, 7 – Final – Freshman Kayla Georgeu pitched seven innings for the Tigers with eight strikeouts, allowing just one earned run. Offensively, Jamie Gottwald was 1-3 with a double and a run scored, Lexie Campbell was 1-3 with an RBI and Missy Krim was 1-2. Taunton, 12 @ Stoughton, 0 – Final (5 inn.) – Taunton’s Katie Van Zandt had a pair of hits and knocked in three runs to pace Taunton’s offense. Jordan Wade went 3-3 with a pair of triple, two runs scored and an RBI and Aimee Kistner added a pair of hits and a pair of RBI. Kistner struck out six in four innings of work while Courtney Fisher struck out a pair in one inning of work. For Stoughton, Brianna Ferrandiz had a pair of hits and Sam Tullis and Gina Carafa each had one. Franklin, 11 @ Andover, 10 – Final – Andover scored to get within one late and won the ensuing draw but Grace McDermott forced a turnover and the Panthers were able to run out the remaining 90 seconds to get the win. Kenzie Pleshaw led the way offensively with six goals, Julia Jette had two goals and two assists and Dani Lonati made seven saves in net. Stoughton, 2 @ Taunton, 3 – Final – Taunton won both matches at doubles and one singles match to edge Stoughton. Connor Briggs and Charlie Fiske won 6-0, 6-1 at first doubles, Caleb Seafort and Kyle Dennehy won 6-1, 6-0 at second doubles and Tom Morrissey won 6-2, 6-3 at second singles. Stoughton’s Adam Potter won 6-2, 4-6, 1-0 (10-6) at first singles and Micah Pellegrini won 6-7 (3-7), 7-5, 1-0 (10-4) at third singles for the Black Knights. Oliver Ames, 14 @ Canton, 2 – Final (5 inn.) – OA’s Jamie Gottwald was 2-4 with a double, a run scored and two RBI. Lexie Campbell was 2-2 with an RBI and a run scored, Missy Krim was 3-4 with two singles, a triple, three runs scored and two RBI, Kayla Georgeu was 1-2 with an RBI, Sarah Tetrault was 1-2 with two RBIs and a run scored and Dalene Gomes was 1-1 with two RBI. Campbell and Georgeu combined for six strikeouts in the circle. Taunton, 3 @ Coyle & Cassidy, 8 – Final – Andrew Wellington, Jared Williams and Ethan Patterson scored for the Tigers. Freshman Griffin Speicher and 8th grader Tommy Joyce each had an assist. Canton, 10 @ Holliston, 8 – Final – Casey Bradley scored a pair of goals and notched a pair of assists to lead Canton to a non-league win. Attleboro, 0 @ Sharon, 5 – Final – Sharon only dropped two games in all of singles play and dropped three in the doubles matches to get the win. Fred Bondar won 6-1, 6-0 at first singles, Han Cui won 6-1, 6-0 at second singles and Tilak Mehta stepped up to win 6-0, 6-0 at third singles. Adam Dobbin and Alex Romantz won 6-1, 6-0 at first doubles and Andre Paolo and Arie Chipanne won 6-1, 6-1 at second doubles. Oliver Ames, 3 @ Canton, 2 – Final – Oliver Ames won twice in singles matches and clinched the win with a win at second doubles. Riley Spillane won 6-1, 6-3 at first singles and Sarah Leger won 6-2, 6-0 at third singles. Rachel Stryke and Olivia Groebe helped clinch the win with a 6-2, 6-2 win at second doubles. Canton’s Skyler Jabbour won 1-6, 6-4, 6-3 at second singles and Tiffany Ha and Sarah MacQuarrie teamed up for a 6-2, 6-4 win at first doubles. King Philip, 0 @ Sharon, 5 – Final – The Eagles won all matches in straight sets. Lulu Yuan won 6-0, 6-0 at first singles, Nupur Shulka won 6-0, 6-2 at second singles and Emily Wen won 6-3, 6-1 at third singles. Pooja Puttigampala and Michal Kondratiev won 6-3, 6-0 at first doubles and Katie Merport and Michelle Cao won 6-4, 6-3 at second doubles. Canton, 39 @ Oliver Ames, 97 – Final – Oliver Ames got first place finishes from Nick Zeoli (400M hurdles), Doug MacDonald (100M), Jarod Boone (1 Mile), Jack Dore (110M hurdles), Belmundo Rodrigures-Pire (200M), Jack MacAdam (long jump), Rodney Sanders (triple jump), Jacob Fies (discus) and Connor Naughton (javelin). Canton’s Pat Hession was first in the 400M, Mark Clancy won the 2 Mile, Ian Ozer won the shot put and Sean Mitchell was first in the high jump. Canton, 70 @ Oliver Ames, 66 – Final – Nicole Brown, Cat Song and Selena Cho all were double winners as Canton scored its first win over OA in many years. Brown won both the 100M (13.0) and the 200M (28.1), Song won the 1 Mile (5:57.7) and the 2 Mile (12:47.6) and Cho won both the long jump and the triple jump. Erika Lum and Hannah Jankowski took first and third in the high jump respectively while Sam Koplik won the 100M hurdles and came in third in the 400M hurdles.